In 1988, following his mother's death, a young Peter Quill is abducted from Earth by the Ravagers, a group of space pirates led by Yondu Udonta. Twenty-six years later on the planet Morag, Quill steals an orb but is attacked by Korath, a subordinate to the fanatical Kree, Ronan. Although Quill escapes with the orb, Yondu discovers his theft and issues a bounty for his capture, while Ronan sends the assassin Gamora after the orb. When Quill attempts to sell the orb on Xandar, capital of the Nova Empire, Gamora ambushes him and steals it. 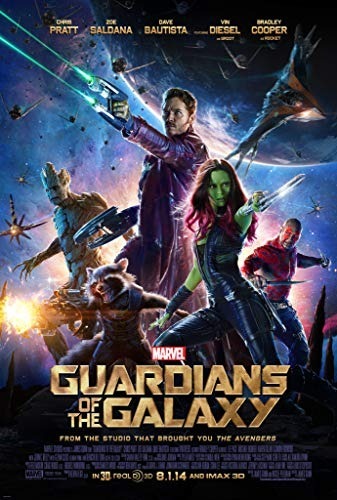 A fight ensues, drawing in a pair of bounty hunters: the genetically and cybernetically modified raccoon Rocket, and the tree-like humanoid Groot. Nova Corps officers capture the four, detaining them in the Kyln. A powerful inmate there, Drax, attempts to kill Gamora due to her association with Ronan, who killed his family. Quill convinces Drax that Gamora can bring Ronan to him, though Gamora reveals that she has betrayed Ronan, unwilling to let him use the orb's power. Learning that Gamora has a buyer for the orb, Quill, Rocket, Groot, and Drax work with her to escape the Kyln in Quill's ship, the Milano. Read more on Wikipedia.